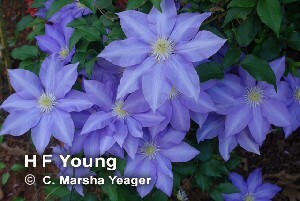 This Lovely old time favorite has large blue flowers with creamy a yellow center. Free flowering and an easy keeper. Treat it as either as a Type 2 for earlier single and semi-double flowers or as a type 3 for later flowers and easy pruning. Named for the Director of the Pennell’s Grimsby Nursery. 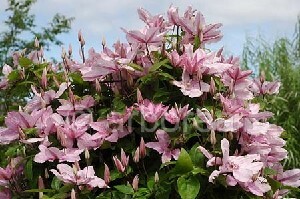 Vigorous and Free flowering. Pale Pink flowers with purple reddish bars. 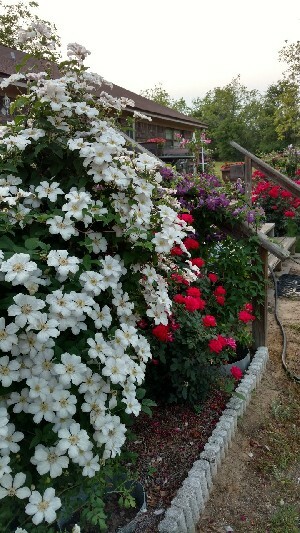 Does well in shady spots and is very easy to grow clematis. Also known as “Pink Chiffon” This Percy Picton Clematis got its name from Hagley Hall where he was once the Head Gardener. Spectacular White Flowers with a faint purple stripe on the back gives the appearance of a pink bar on the front. Yellowish anthers. Free flowering and a rapid grower. This picture is from my favorite customer Toni in NW Florida.